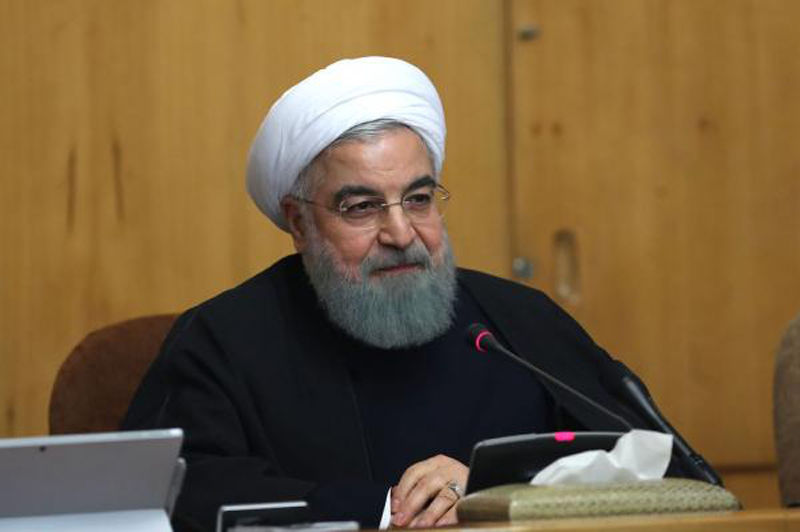 Iranian President Hassan Rouhani warned the United States Tuesday against leaving the Obama-era nuclear deal, as President Donald Trump talks it over with French President Emmanuel Macron. "We are standing by our commitments stronger than ever before," Rouhani said. "However, anyone seeking to betray their commitments to us should know that the grave consequences of such a move will affect themselves." Trump has long been critical of the deal, formally known as the Joint Comprehensive Plan of Action, and has set a May 12 deadline to decide whether the United States will withdraw from the accord. Calling the deal "terrible," Trump vowed in January to withdraw from the agreement in May if the "flaws" of the JCPOA were not fixed. Trump was asked Tuesday about the possibility of Iran restarting its nuclear program if the United States withdrew. "They're not going to be restarting anything," he said during an appearance with Macron at the White House. "If they restart it, they're going to have big problems, bigger than they ever had before." "We'll see," he added. "People know my views on the Iran deal. It was a terrible deal. It should have never ever been made." Trump blamed Iran for multiple conflicts in the Middle East, including in Syria and in Yemen, while Macron said the goal was to "contain Iran and its presence in the region." The JCPOA, agreed to in 2015 by Iran, China, France, Russia, Britain, United States and Germany, gave sanctions relief in exchange for Tehran limiting its nuclear program. Under the terms of the deal, Iran agreed to eliminate its stockpile of medium-enriched uranium, cut its stockpile of low-enriched uranium and reduce its number of gas centrifuges. Some of the restrictions on Iran are scheduled to be lifted after 10 and 15 years. Iran's Foreign Minister Javad Zarif, who helped to broker the historic deal, told NPR a U.S. withdrawal from the agreement would damage the country's credibility. "I think the United States doesn't want to send the message to the world that if you negotiate with the United States, the U.S. is going to come back after you had reached an agreement and tell you 'I don't like these parts of the agreement and I want them re-negotiated,'" Zarif said. European leaders have also been pushing for Trump to stick with the agreement. British Foreign Secretary Boris Johnson said Monday during a G-7 summit in Toronto that he hoped Trump would preserve the accord, despite "anxieties" about Iran. Russian Foreign Secretary Sergei Lavrov said he and his Chinese counterpart had agreed to block any U.S. attempt to sabotage the deal. Macron, another supporter of the deal. arrived in Washington, D.C., Monday for an official state visit to the United States. In an interview with Fox News Sunday, the French leader suggested it would be a mistake to withdraw from the pact. "You cannot make a trade war with your allies," Macron said. "It's too complicated if you make war against everybody. You make trade war against China, trade war against Europe, war in Syria, war against Iran, it doesn't work. You need allies." German Chancellor Angela Merkel has also defended the deal, telling an Israeli TV station she'd rather have an imperfect deal than no deal at all. She will visit Trump Thursday.